It’s late autumn and thick layer of frost covers the ground. You feel wistful and maybe even a little sad. Surprisingly, there seems to be no reason for this feeling. Most of us can shake it off and get back to work or perk up with a hot cup of coffee, lots of chocolate and good company. Unfortunately, a rare few suffer from sadness during the entire dark, dank season. It may even develop into full-blown depression lasting the entire winter. Scientists have not been able to isolate an exact cause for winter depression, so much about the condition remains a mystery as it varies in severity. Those with the most serious symptoms are diagnosed with a condition called SAD, or seasonal affective disorder. However, varying degrees of the condition may remain undiagnosed in other patients. Most researchers attribute SAD to the lower light levels seen during winter and have since developed light therapy treatment. In this treatment, the patient is exposed to high intensity light for a specific amount of time daily. Results show that the therapy does seem to suppress melatonin production in the morning hours, which is a hormone that, in excess, makes us sleepy. Melatonin therapy can also be used in later hours to adjust internal clocks. Fortunately, not everyone affected by seasonal changes is suffering from SAD. There might be social, physical and regional factors that are influencing and causing the depression. Instead of immediately resorting to medications and therapy, researchers recommend lifestyle changes that can help control depression holistically. Increase Exercise: Exercise boosts physical health and jumpstarts the brain by releasing endorphins and boosting serotonin. Endorphins are natural morphine-like substances that can cause a feeling of euphoria or happiness, and serotonin is known as the happiness hormone. A minimum of 30 minutes per day can be more than enough to keep depression at bay. Combine your exercise with exposure to sunlight at an outdoor location to see the most benefits. If you aren’t a fan of jiggling your body at a gym, yoga and meditation seem to work just as well. Avoid Stress: Stress can be due to a lot of things, such as dreading visiting family over the holidays or even finances and work-related issues. Although it’s not possible to avoid everything stressful, you can try to limit it. For example, say no to family get-togethers or cut your visit short, plan for your vacation fund by buying affordable gifts throughout the year, and control your work-related issues by staying organized. 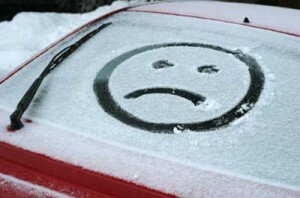 If you say goodbye to stressors, you can perhaps say goodbye to winter depression. Improve Diet: Eating the right food at the right time is essential to controlling winter depression. Researchers recommend a balanced diet with plenty of fresh fruits and vegetables (sometimes hard to find in the cold months, so stick to what’s in season), lean protein and dairy. It’s also a good idea to avoid fattening party foods. If you do have to eat out, fill up in advance with healthier food so you’re not starving when you get there. If possible, cut down or quit drinking alcohol or smoking. You can control what you feel during the winter season with a few lifestyle changes, but each individual can experience various degrees of depression. A word of caution: if you feel overwhelmed or desperate at any time, get in touch with a medical professional immediately. It’s not necessary to deal with winter depression alone.